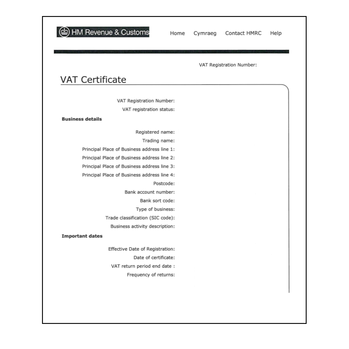 A VAT registration certificate is a document issued by HM Revenue and Customers attesting the fact that a company is registered for VAT in the UK. If your business is trading internationally then you may need to provide evidence of this. For ONLY £66 we arrange for your VAT Certificate to be issued with the apostille. Get the document signed and certifed by our solicitor. How to order an apostille for your VAT certificate? Simply purchase the service online and post or email your document to us. We are unable to obtain this document on your behalf. If you have multiple documents relating to one company we can combine these into a bound set to save you money. The documents will be legally bound together with a solicitor's cover sheet and one apostille will be issued to legalise all documents contained therein.